The design of The Broad museum is nicknamed “the veil and the vault”. The Broad Museum was constructed at Grand Avenue, in close proximity to Walt Disney Concert Hall and the Museum of Contemporary Art (MOCA). The landscape architect for the project is Hood Design. A restaurant, adjacent to the Public Plaza, was developed by Bill Chait. A 105ft escalator and a circular glass elevator take the visitors from the first floor to the third floor gallery. The 35,000ft² column-free gallery on the third floor is fed with natural lighting. Visitors have sight of the archives, through windows, along the stairways, leading down from the top gallery to the first floor. The veil lifts at the corners provide access to the lobby on the first floor. The arched underside of the second floor serves as the ceiling for the lobby. A night view of the Pubic Plaza. 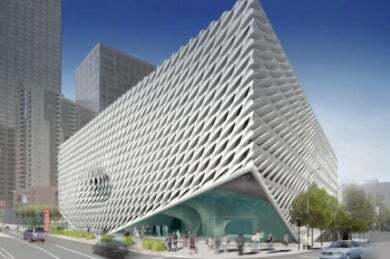 The Broad Museum is a post-war and contemporary art museum was constructed at Grand Avenue in downtown Los Angeles, California, US, by philanthropists Eli and Edythe Broad. The building provides 50,000ft² of gallery space and 21,000ft² of climate-controlled archive storage space. "The building houses approximately 2,000 works by around 200 artists within the collections of The Broad Art Foundation and the Broads." The project further incorporates an outdoor public plaza, whose construction was completed in 2014, an outdoor restaurant and an underground parking area to be owned and operated by the community redevelopment agency (CRA). The overall construction cost of the project was estimated at $195m, while the construction cost for the museum itself was estimated to be $140m. The site selection for the museum was completed in August 2010 and architect Diller Scofidio + Renfro unveiled the design of the building in January 2011. Project construction began in March 2012 and the museum was opened in September 2015. The building houses approximately 2,000 works by around 200 artists within the collections of The Broad Art Foundation and the Broads. It also serves as the headquarters to the foundation’s worldwide lending library, which was founded by the couple in 1984. Dubbed as the ‘the veil and the vault’, the design concept is derived from the archival function of the building and its veil-like exterior. A combined 155,000ft², three-storey underground parking area for 366 cars is located at the base of the three-storey museum. A master plan has been unveiled to expand and overhaul the Norton Museum of Art in Florida, US. The new art museum covers an area of 120,000ft² and has two street-level entrances from the first floor that features a public lobby with a bookshop and espresso bar, a museum shop, a 15,000ft² gallery for special exhibitions, a multimedia space and an archive storage facility. The second floor houses an archive storage facility, the museum offices, conference rooms and a lecture hall for 200 people. The third floor is exclusively reserved for the column-free gallery covering a floor space of 35,000ft² and roofed 23ft-high. The floor receives ample natural lighting from 318 skylights and windows. A 105ft escalator and a circular glass lift connect the first floor to the third floor gallery, and stairs connect all three floors. Archives located on the first and second floors are visible to the museum visitors through designated windows while walking down the glass-enclosed stairways. A porous, honeycomb-style, exterior structure wraps the building on all sides and provides filtered natural daylight within the building’s galleries and public buildings. The veil lifts at the corners provide access to the lobby on the first floor. The veil is supported at three points: 2nd Street, General Thaddeus Kosciuszko Way and the main 32t, 57ft-long touchdown beam on Grand Avenue laid 5ft below the pavement, which can handle loads of up to 3,000t. The materials used for the construction of the building include concrete, steel, glass fibre reinforced concrete (GFRC) and glass fibre reinforced gypsum (GFRG). Up to 36 million pounds of concrete was used for the construction, while the exterior veil is made up of 2,500 GFRC panels and 650t of steel. The roof comprises 190ft steel girders weighing approximately 70t each, and a 40ft cantilever is placed over the third floor gallery glazing. The galleries were fitted with 52 4,881lb glass panels, while up to 37 glass panels weighing 2,198lbs each were placed in the lobby and seven glass panels weighing 2,044lbs each were placed in the lecture hall. The public plaza constructed in the south covering an area of 24,000ft², features tree stump tables. The seats, made from Barouni olive trees, are movable to enable easy reconfiguration. The surfaces were laid with decomposed granite, concrete paving, grass lawn and flowering ground covers. Olive trees as old as 100 years featured within the landscaped plaza juxtaposing with the new buildings within Grand Avenue. The surrounding pedestrianised areas connecting the museum and the plaza were also improved. The restaurant was built on the western end of the plaza by Bill Chait in collaboration with Timothy Hollingsworth and Rory Herrmann. The building design aims to secure LEED Silver certification. Some of the supporting features include electric car charging stations, rooftop drains routed to street level gardens, which further filter runoff and high-efficiency plumbing fixtures within the building to reduce water use by about 40%. The building’s close proximity to public transport including the new Metro Regional Connector station at the corner of 2nd Street and Hope Street will also significantly cut emissions. The executive architect for the museum is Gensler, while Adamson Associates is the executive public spaces architect. MATT Construction performed the construction using a 3D modelling software named Digital Project, which was managed through Gehry Technologies. Hood Design is the landscape architect for the project. Arup provided the mechanical, electrical, plumbing, fire life-safety and lighting engineering works for the galleries, while Tillotson Design provided the lighting design. The structural engineers are Nabih Youssef & Associates and Leslie E. Robertson Associates, while KPFF Consulting Engineers is the civil engineer. Saiful Bouquet Structural Engineers provided the structural works for the Plaza structure, including the restaurant. Busch-Jaeger is a leading supplier of electrical installation technology for both residential and commercial properties. Easy and time-saving installation. Convincing and professional. For the pleasant feeling of safety. Convergent Group offers advanced floor care solutions for industrial concrete surface treatments. As a leading manufacturer of nano-lithium products such as Pentra-Sil® (NL), the group provides high-quality treatments for use as surface hardeners, sealers and densifiers, and also for the preservation and maintenance of new or old concrete floors.